Event host with speakers Eamonn Kennedy, Chelsea Mauldin, and Henry Poskitt at the 2017 DesignFix Symposium. The lack of a clear communication channel with government leaves millennials feeling disconnected from their public institutions and represents a missed opportunity to utilise technology to reverse falling trust in government. This is according to a white paper, the result of an Irish-led international design collaboration which has spent the past year researching anti-government populism. Pointing to the Brexit vote and inspired by the rise of populism in America and across Europe, Dublin based design agency, Frontend.com, decided to explore this issue using their Design Thinking methodology. They argue that governments need to embrace a new model of citizen engagement which can enable citizens to contribute more effectively on an on-going basis and provide governments with a direct channel to communicate with citizens; bypassing biased reporting and offsetting the effects of fake news. The team note that technological advances, particularly recent improvements in artificial intelligence, could be instrumental in facilitating these interactions; which would work much like messaging apps. “Our research kept bringing us back to the fact that people perceive government differently and that sentiment lines are clearly drawn between those who see government as a tool which empowers them, in contrast to those who feel they are in a subservient role to government. This doesn’t just affect your likelihood to engage civically but also your trust and belief in those public institutions”, explained Frank Long, director of Frontend.com. In collaboration Irish social insight strategists Storyful, Canadian online collaboration consultants Publivate and Artificial Intelligence consultants Atrovate, Frontend.com have published the white paper ‘Rules of Engagement; Design Principles for Civic Dialogue in A Post-Truth Era’ which details considerations for more direct and personalised engagement between governments and citizens. Working with students from NCAD, IADT Dun Laoghaire and the University of Limerick’s CSIS department, the collaboration also produced a design concept based on the design principles in the white paper. “Design Thinking has become ubiquitous in product design and business. But ironically our public institutions, which by right should be the most responsive to the people they serve, have historically made it very difficult to participate in the policymaking process” continued Long. “Our research and international precedent demonstrates that these principles of making it easy for citizens to engage and directly communicating back to them can restore faith in our democratic systems”. 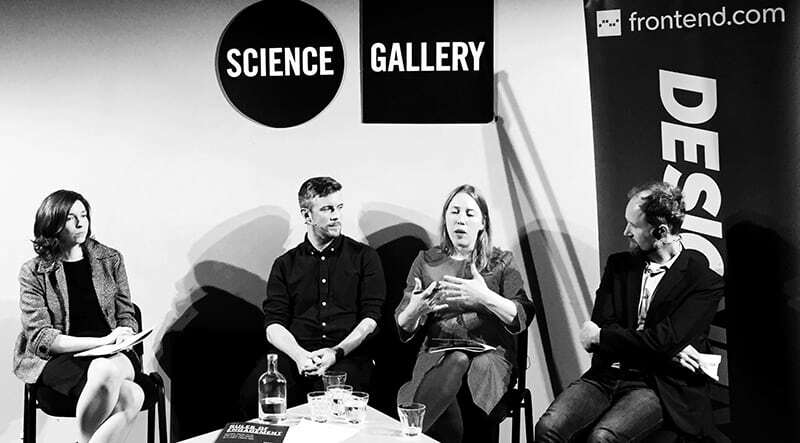 The white paper was unveiled at the DesignFix Symposium; ‘Is Democracy In A State of Emergency’ at the Science Gallery, Dublin as part of their ‘In Case of Emergency’ exhibition on Tuesday 24th of October. Chelsea Mauldin, Director of the New York-based Public Policy Lab, and Eamonn Kennedy, Chief Product Officer at Storyful, joined Henry Poskitt and John Buckley of Frontend.com to launch the collaboration.